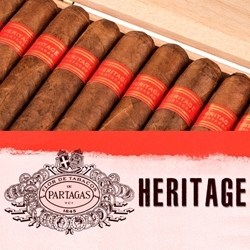 Partagás Heritage hand-rolled premium cigars are made with a reddish-brown Honduran wrapper developed exclusively for this line. Each tobacco leaf is grown in the volcanic soils of the Olancho San Agustin Valley. Dominican Piloto Cubano and Mexican San Andres tobaccos infused this premium cigar with a Connecticut Broadleaf binder which adds a subtle sweetness with notes of cinnamon. The finished product is a very complex medium-bodied smoke with flavors of earth, nuts, coffee, leather, and some natural sweetness on the palate. Smokers Discounts has made it affordable and easy to buy Partagás Heritage hand-rolled premium cigars online. Every product can be delivered right to your doorstep. A variety of sizes and flavors are listed below in our online cigar store. Each of these styles are in stock and available for a low discount price! Call us for more details!